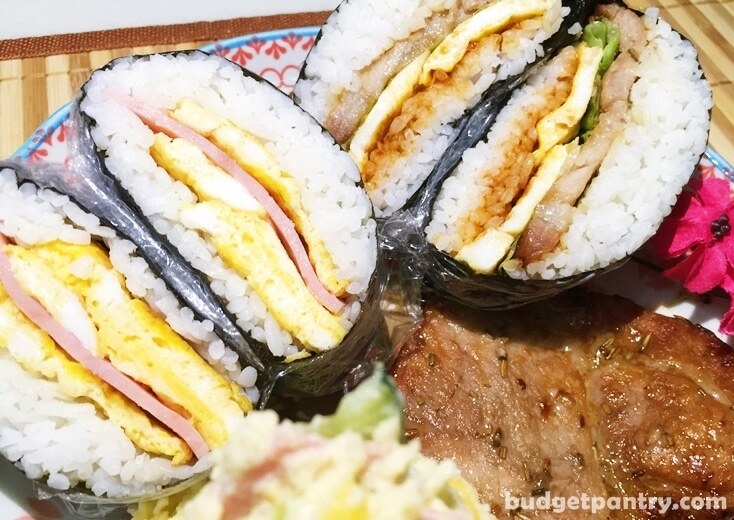 Onigirazu (Japanese Rice Sandwiches) is derived from Onigiri (Japanese rice balls). According to Eating With Your Hands, Onigirazu means “no shaping”. 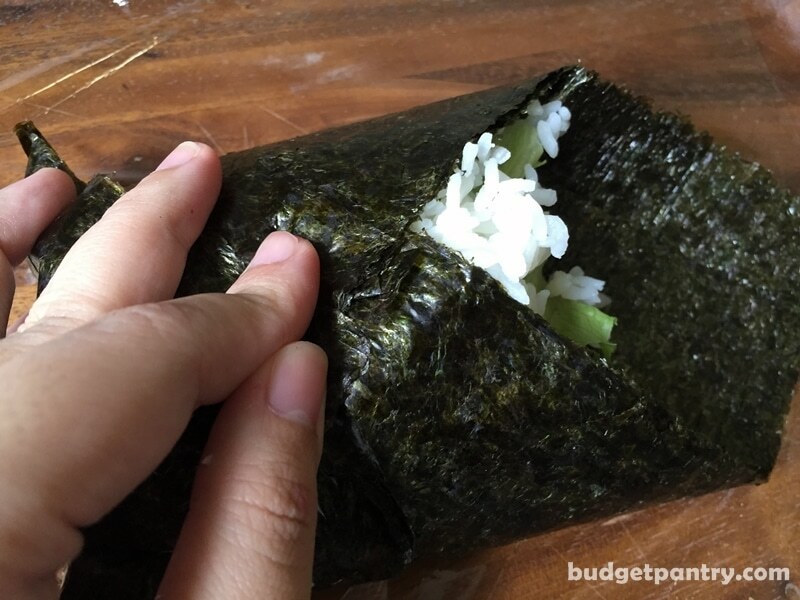 When making Onigiri, the rice needs to be shaped into a triangle, but no squeezing/shaping is needed when making Onigirazu. This explains the “razu”, which means “none”, or “without”. 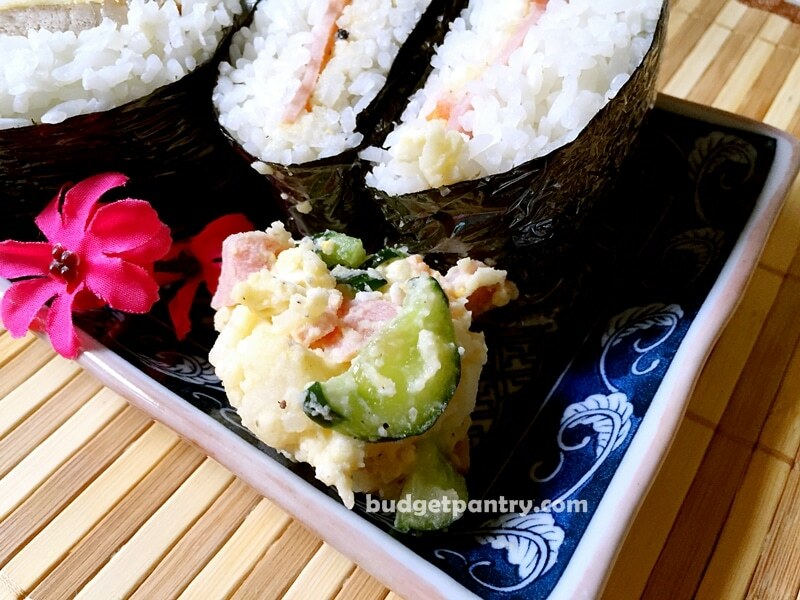 For the longest time, the husband has been hoping that I would make Onigirazu. 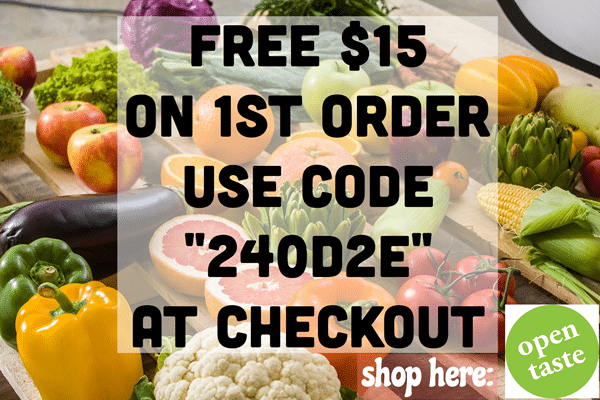 And why not, I thought, since these fit right into my “Approved” list of fuss-free food to cook. 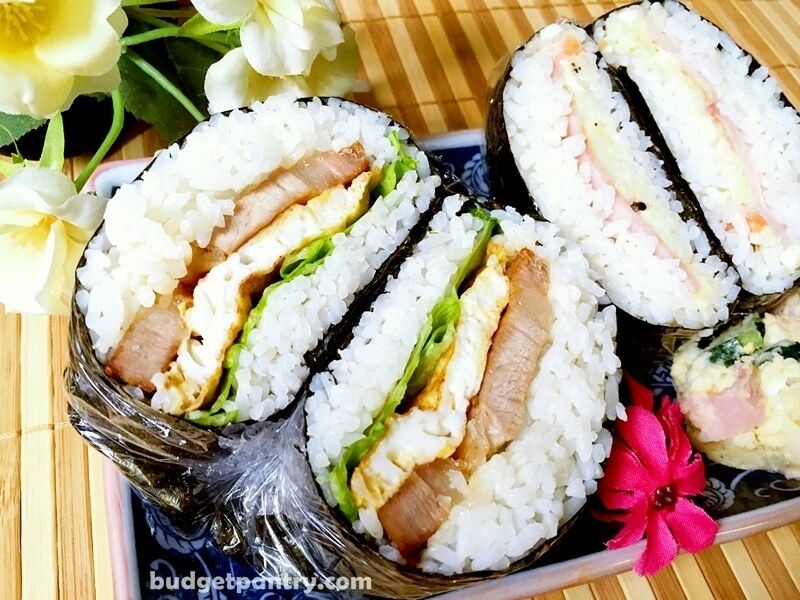 These Japanese rice sandwiches can be filled with allll sorts of ingredients! This time round, I made two variations – the pork chop version and one with Japanese potato salad and ham. I’m going to give you the recipe for the pork chop since I’ve blogged about the potato salad recipe before. 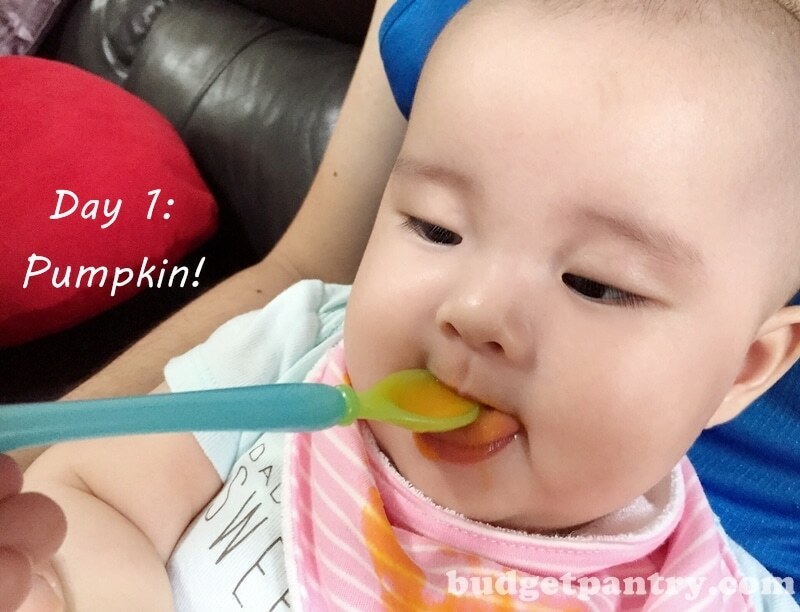 Wrap tightly and slice with a sharp knife! Have fun with these.. the combinations are endless. I have made these with crispy fried chicken cutlet, grilled portobello mushrooms, Japanese hamburger steaks, luncheon meat and lots more. Can’t wait for cbb to grow up so I can prepare make bento boxes for her to take to school. Hehe. These are perfect for kids’ school excursions or even as a weekend project with your kiddos! Very minimal mess (for you) to clean up and they’ll love making it too, I promise! Cook: Marinate the pork shoulder in soy sauce and mirin for an hour. Airfry in 180C preheated AF for 12 minutes. Alternatively, pan fry in a little oil till done. Set aside. Fry the eggs into an omelette, then cut into 4 slices. Set aside. 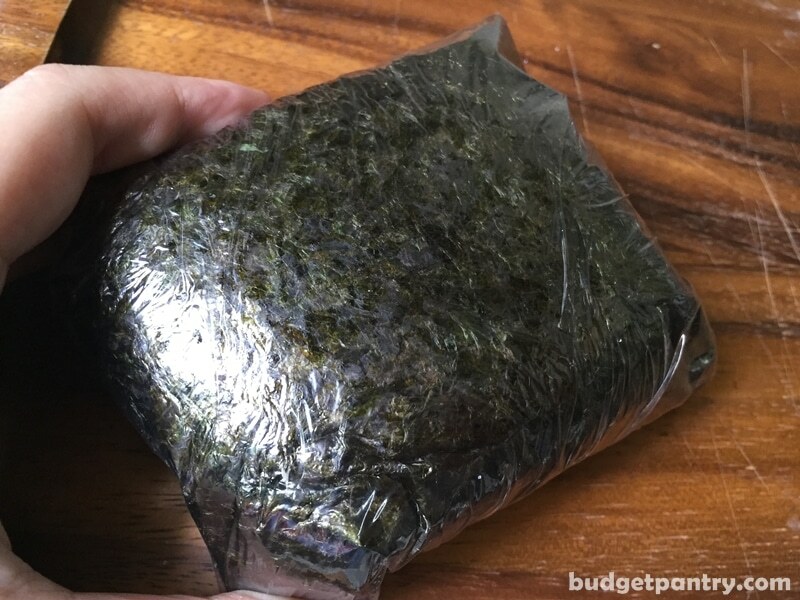 Start by placing the cling wrap on a flat surface, followed by one seaweed sheet. Angle the seaweed such that one of the corners is pointing upwards. Divide the rice into four portions. Place a scoop in the middle of the seaweed. 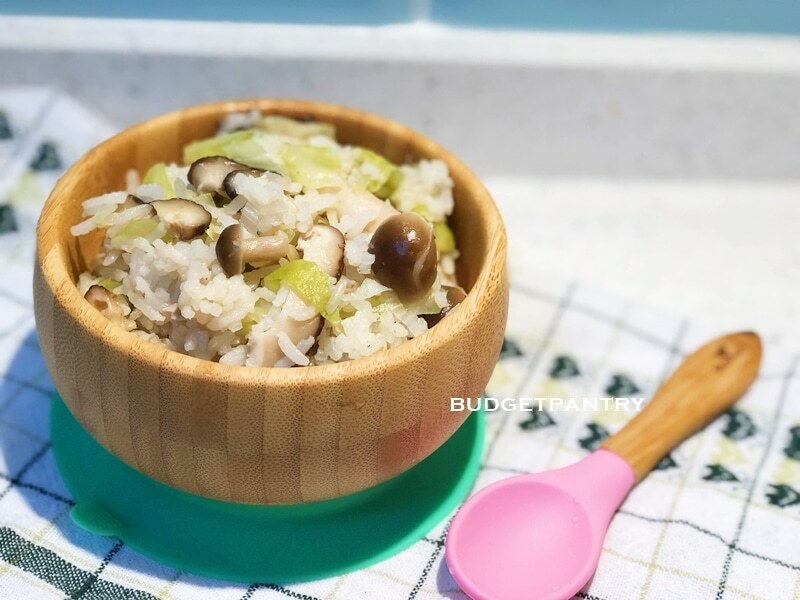 Use the rice paddle to arrange it into a square shape. Try to be as neat as possible but don’t worry if it’s a little out of shape. Sprinkle a little salt on the rice. 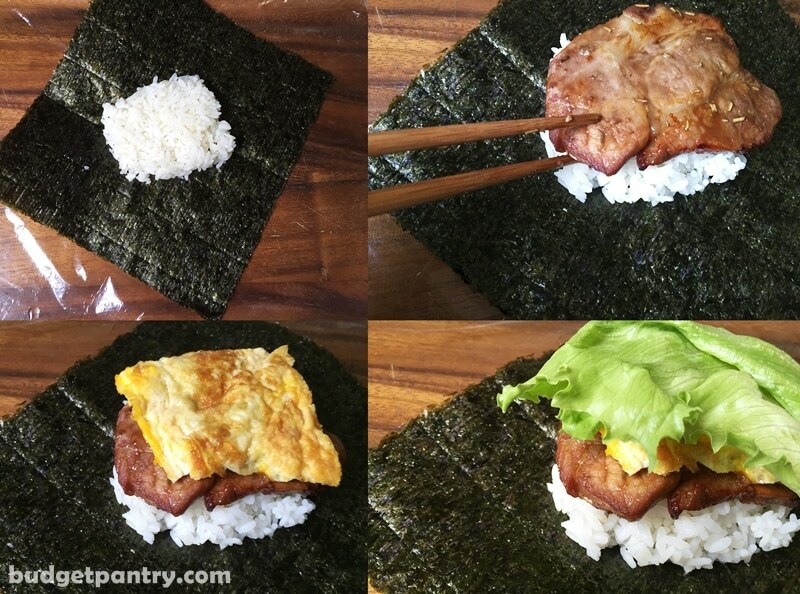 Top with pork chop, then follow with mayonnaise, omelette slice and lettuce. Finally, top it off with another scoop of rice. Take two corners of the seaweed and fold them inwards. Wrap tightly and ensure that the fillings remain in the centre. Take the other two corners and repeat. 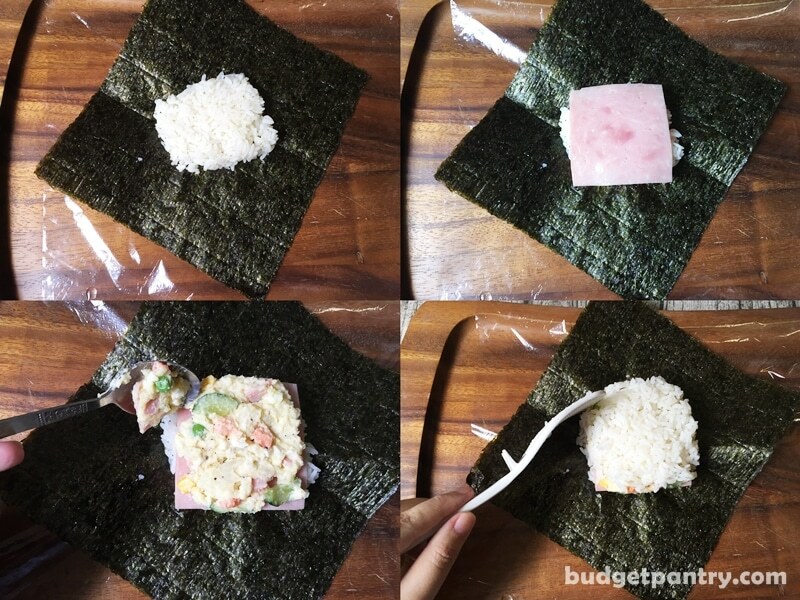 Your Onigirazu should look like a neat square box. Now wrap the four corners of cling wrap one by one around the Onigirazu, then turn it face down and rest for five minutes..
Repeat the above steps for the second Onigirazu. 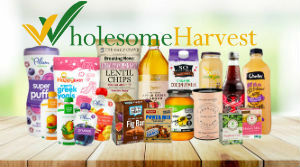 Cut into half and enjoy!